An heirloom tomato tart is a savory treat that you can prepare using a number of different ingredients and methods. 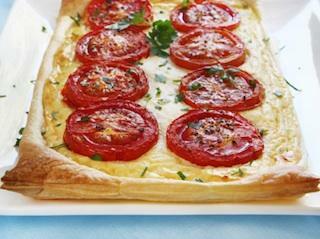 Bake a delicious tart that highlights the fresh flavor of this tomato variety. Many different types of heirloom tomatoes are available including vibrant red, dark red, golden, or pink. Consider mixing the type of heirlooms in your tart recipe to create a visual masterpiece that has mouthwatering results. Brandywine tomatoes may be pink or red, are very flavorful and sweet with a good balance of acidity. Amish paste is a dark red tomato that has few seeds, making it a nice choice both visually and structurally. Arkansas traveler is pink, firm and ideal for serving fresh in salads. Big rainbows are yellow with stunning red streaks and mild flavor. Djena Lee golden girls have orange and golden hues with a very sweet and tangy flavor. Heirloom tomatoes are quite juicy when ripe and their liquids can seep into the crust, creating an unappealing, pasty consistency. A simple step can prevent the tomatoes from seeping too much. Place washed, sliced tomatoes in a single layer on two layers of paper towels. Sprinkle them lightly with salt and place another paper towel on top, pressing lightly. Allow the tomatoes to rest there until you are ready to use them. The paper towels should absorb some of the liquid without interfering with the taste. Few things pair as well with tomatoes as cheese, and there is a delectable selection from which to choose. Hard cheeses like Asiago or Parmesan make excellent complements to the fruit and can be cooked in the pastry crust to impart an inciting aroma. Homemade mozzarella, tomato, and basil is a classic combination that is guaranteed outstanding results. Goat cheese is a flavorful choice that offers many different varies, depending on how long it is aged. Gruyère cheese is harder than mozzarella and goat cheeses, but melts to a honey smooth consistency. This recipe has a slightly spiced crust that helps brighten the flavor of the tart. Fresh mozzarella gives the tart a mild contrast that pulls it all together. Place the flour, butter, shortening, Parmesan, pepper, and salt in a food processor. Pulse until the dough forms pea-sized lumps. Slowly add the water, one tablespoon at a time, pulsing until the dough holds together when you squeeze it. Stop pulsing immediately at this point, as it is very easy to overwork the dough. Turn the dough out onto a floured counter and knead it with your hands until smooth. Roll the dough into a ball and wrap in plastic. Refrigerate for one hour. Roll out the dough to approximately 12 inches in diameter and place in a nine inch pie pan. Trim the excess dough off the edges of the pan and prick the bottom of the dough with a fork. Line the dough with aluminum foil and fill with dried beans or pie weights. Bake in an oven heated to 375 degrees for 20 minutes. Remove the beans or weights and aluminum foil and continue to bake until golden brown, which takes about 15 minutes. Allow the pie shell to cool completely, and then turn it out of the pan. Arrange roughly 1/3 the mozzarella slices onto the bottom of the pie shell and drizzle with pesto. Arrange 1/3 of the tomato slices on the pesto. Repeat with the remaining cheese, pesto, and tomato two more times. Many tomato tart recipes require you to cook the tomatoes with the crust while others suggest it is best to simply allow the raw tomato flavor to shine in this dish. The choice is entirely yours, but many swear that the best way to enjoy the true flavor of the fruit is to serve them raw in a prepared tart shell. Just as a kitchen has staple ingredients, a gourmet cook has staple recipes. The heirloom tomato tart is a savory classic that should be attempted at least once.